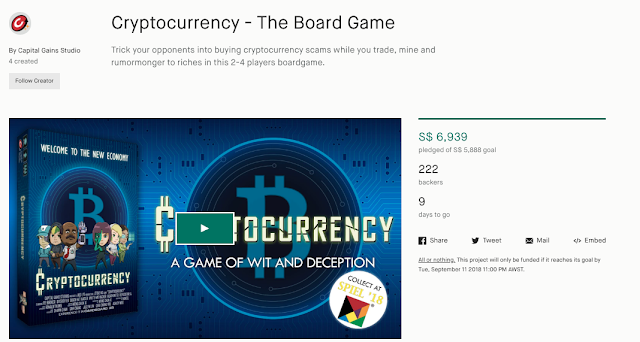 If you've ever wondered about the cryptocurrency world, or how to teach the concept to a newbie, there's now a new game in the market to help you. 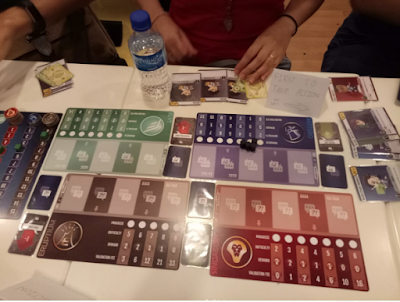 Developed by none other than the guys behind Capital Gains Studio (yes, the same folks behind Wongamania and Debtzilla), I was recently invited to play the game and LOVED it. This is one game I'll use to teach my friends about cryptocurrencies and how they work in the real world. There's just so much information out there that it can be really confusing, and many get so intimidated that they don't know where to start. Not anymore! This game introduces beginners to the basic concepts of mining, trading and market manipulation that is so often rampant in the cryptocurrency world. And, just like how the flow cryptocurrencies is completely transparent and traceable (unless you use privacy coins) on the blockchain, you'll also be able to see what coins the other players hold, and what strategy they're leveraging in order to try to win. Want to go on the offense? Try sabotaging their coins. Or you can also take the defensive route and protect your own coins instead while you build up your assets in that particular cryptocurrency. Just be careful that someone else doesn't manipulate it such that it becomes a scam coin at the end of the game, which will make your wealth worthless! During the game that I played with 3 other players, each of us picked vastly different strategies. It was interesting to see how even someone who had played the game before didn't really have much of an edge against the rest, because you can't really control the events that happen in the cryptocurrency (game) world and the game dynamics each time is always different. One picked the mining strategy and assembled a team of technological experts to help her increase her odds of success. A successful mining exercise will reward you with cryptocurrencies and transaction fees, while a failed attempt gives you nothing. And just like in the real world of crypto, mining gets more difficult over time as more people choose to mine that coin. Another took the trading route, where he manipulated the market to buy and sell cryptocurrencies. With every 4 units bought or sold, the price gets pushed up or down respectively. This mimics the real-world action of folks whom we call "whales", who manipulate the market prices as well due to the substantial volume they can take up (or let go). You can read more about whales and price manipulation in the crypto markets here. Lastly, we also had the rumours, which all of us engaged in. As I've highlighted before, rumour mongering is extremely common in cryptocurrencies, and that's why there are so many people falling for scam coins aplenty (some of which I've exposed on this blog before). 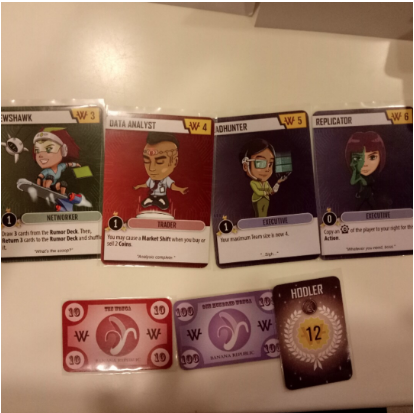 In the game, we had the chance to deploy one open or hidden rumour card on each crypto coin, and the race was on to make a particular coin become THE scam coin of the game so that the player who HODL (held on for dear life) onto the coin would lose money. There's no winning strategy per se, because even my strategy was part luck and part skill. As mentioned, luck and events play a huge role in this game, so it is hard to have full control all the time! Adapting as the circumstances change would be key (and that's another crucial skill to have in the real-life crypto world as well). I personally used a combination of mining (where I got quite lucky), traded somewhat, and also manipulated the market with the rumour cards that I put out. At one point, flush with cash, I also employed the whales strategy and moved the prices with my buying and selling. If When I get to play this game again, I'd want to try out the other strategies as well and try winning on them! 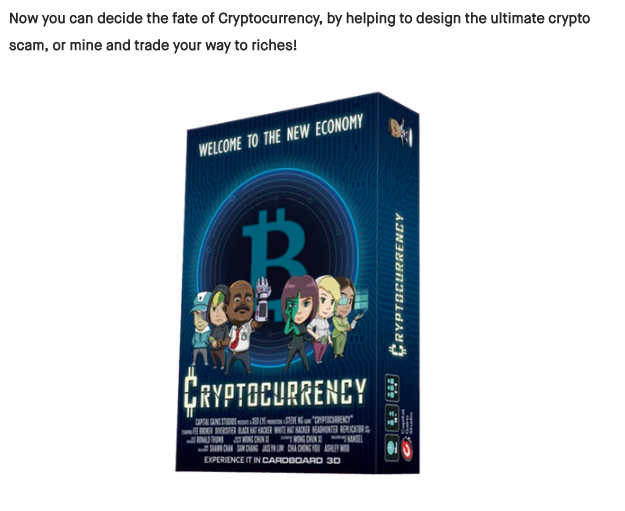 If you're looking for a fun and light-hearted way to learn about the new economy of cryptocurrencies, this board game would be perfect. My only gripe is that given the level of the concepts being taught, the makers seem to be aiming a little too high when they say this game was designed to be suitable from secondary school level and up, because I feel as though it'll be too hard for them to grasp. Support Cryptocurrency the board game on Kickstarter here! The game has already been fully funded with minimal marketing, and even before I was done with this blog post, so I guess you'll soon be seeing it sold in retail stores at its full price of $39. This is your best chance to get it at a discount while they're still in Kickstarter stage! There's only 10 days left till the project ends. P.S. Not sponsored to write this review, but am doing so because I genuinely enjoyed the games created by Capital Gains Studio since 2015 when Wongamania was first launched! This game was no exception, and I'm happy to support them once more with my own money backing the project. All opinions expressed are of my own. Thank you BB for taking time to do this review!